New Delhi, the 4th August, 2010. (i) These rules may be called the Central Civil Services and Civil Posts, Lower Division Clerk (Educational and other Qualifications for Direct Recruitment) Rules, 2010. 2. Application. — These rules shall apply to all posts of Lower Division Clerk in the Central Civil Services and Civil Posts under the Central Government and under the Indian Audit and Accounts Department. (ii) should pass type writing in English with a minimum speed of 35 words per minute or in Hindi with a minimum speed of 30 words per minute on computer (35 words per minute and 30 words per minute correspond to 10500 KDPH/9000 KDPH on an average of 5 key depression for each word)”. It is very good to see that Minimum qualifiction for direct recruitment of LDC has been fixed as PUC II with typewriting. But why the authority is neglecting LDC's grade pay. When authority is required more qualified persons to the post of LDCs then the authority should also think over to increase the grade pay. The LDC and UDC staff are taking more responsibility to discharge office work and assisting their superiors in importent Official works. they are maintaining Service Records of all the staff, keeping track of permanent Assets of the Prublic property, drawing salary of all the staff etc., and also drafting Impotent Offical communications. It is very essential that grade pay of LDC should be increased to Rs.2400.00 and Grade pay of UDC should be Rs.2800.00. My humbly request to the authorities is to consider this issue and try to do the need full. I also request all the LDC's and UDC's they should also give their comment in this issue and if possible try to communicate this issue to the higher authorities. Research Centre, Bellary -583 104. If authoties want to make LDC/UDC more responsible, it should be essential to increase the Grade pay of LDC Rs. 2400 & UDC Rs. 2800/- After pay commision the grade pay of Gr. D employes are 1900/- equal to LDC, so no difference between peon & LDC(Who have passed a competative exam). I request to authorities to take this issue on priorty basis and make better enviorment for working capicity of LDC & UDC. Yes, I do agree that there is no difference between an LDC(who has been recruited through competative exam) and a peon or messenger working along with u, drawing the same GP. I also recommend for the increase in Grade Pay of LDC to Rs.2400/- to boost up their working spirit. Yes, i agree with my brothers and sisters serving in the clerical cadre. At present there seems no difference between a fourth class employee and us. There is a mere difference of just Rs. 100, not more than that. Our unions must take up the case strongly with the Govt. for incresing working sprit among the clerical staff. Also the Govt. itself must think whether is it justified what they are paying to us in comparison to the work/duties and responsibilites given to us? Pls I request that the same may be cosidered in mind both, by the Govt. and our Unions. Thanks and all the best for a favourable decision in the matter. I strongly back the above comments.The grade pay of LDC should be atleast 2400 as there is only a mild difference between LDC and peon as of now whose work load and responsibilities are entirely different.Considering the present scenario of high qualified people getting into the LDC posts, the gradepay should certainly be upgraded to cater the needs.Also the grade pay revisal would help a government LDC to be monetarily independent and get a decent living in the current problematic economical situation. rightly...the gp of ldc should be minimum 2400 and udc should be minimum 2800...why the policy making/decision making persons are silent on this issue?? ?unless these persons asked for their this are not goin to consider!!! I strongly back the above comments.The grade pay of LDC should be atleast 2400 as there is only a mild difference between LDC and peon as of now whose work load and responsibilities are entirely different.Considering the present scenario of high qualified people getting into the LDC posts, the gradepay should certainly be upgraded to cater the needs. After putting yrs. of service i.e. more than 30 yrs. also we are not getting the GP of Rs. 4600/- also, whereas compared to other departments of Defence ministry the GP is higher than our. Yes, I areed to this point. As LDC/UDC are dealing with responsible job and their grade pay should be increased to 2400/2800 respectively. As mentioned in above note that class D employees are already drawing GP of 1800/1900 and where as LDC are drawing GP of 1900.Thus the LDCs who are working with group D employees have lost their interest as grade pay is difference of Rs 100. It is requested that necessary unions and Govt Officials to look in to the matter and favourable decision is anticipated. 100% it is welcomed that this decision is taken by the Govt. At the same time the decision maker should always see that welfare of these cardes should be increased to such a level that, nobody should think of money from other sources!These LDC/UDC are hadling with all types of information which is very much important to the development of the our nation.Hence when ever they take decision about the hike in the pay,they should clearly take all the aspects befor implimentation. The railway worker working against superannuation post as tech III,qualification class 4th. Due for retirement in next 17 month. Posted as Jr clerk and transfered to other depot. Worker is unable to carried out transfer and to accept the order. Can he retained were he his. What are latest instruction to deal such type of cases. Its an injustice with the clerical cadre throughout India imposed by the sixth CPC. I want to ask what kind of criterias or parameters or measures or calculations used for fixation of grade pay by the CPC for clerical cadre, which is unkonwn. The other all posts filled by the service commissions constituted by the Govt.is comparatively far better than clerical cadre who also qualify the written and technical examination conducted by the Staff Selection Commission. Most of the cadres exists in Govt. service they are appointed by means of edn. qualification and an interview were drawing higher grade pay than clerical cadre with same edn.qualifation. It is my request to the authority concerned in the Govt. to review the grade pay of clerical cadre and a dignified grade may be granted so as to overcome the clerical cadre from demoralisation. Work/assignment like proper and prompt documentation, record keeping, typing work and presently good computer operating etc. done by the LDC/UDC which is required high skill and mental ability with knowledge. As per recruitment rules LDC/UDC is promoted against the post in the hierarchy after completion of required regular service but most of the time LDC/UDC is not getting the promotion upto 10 years after completion of required regular service in the post due to non availability of higher post in the hierarchy. For example : as per rule a LDC is required at least 5 years regular service in the grade for promotion to the post of UDC but he is not getting promotion due to non availability of the post after completion of 15/16 years of regular service, after that he is promoted to the post of UDC in this situation he is required 10 years regular service in the post of UDC for promotion to next higher post in the hierarchy. The MACP is not helpful in the situation because the MACP seems like a band-aid on cancer tumor not a surgery. Keeping in view of above, it clears that the present grade pay is keeping for LDC/UDC is not justified. Hence, the grade pay of LDC/UDC should be increased i.e. 2400 for LDC and 2800 for UDC w.e.f. 01.01.2006. LDC or Junior Assistant as they are called now should be given a Grade pay of Rs2400 as i believe Rs1900 as GP is quite discriminatory and it really hurts. The Lower Division Clerk and Upper Division Clerk are taking more responsibility to do office work and assisting their superiors in importent Official works. they are maintaining Service Records of all the staff and officers, keeping track of permanent Assets of the Prublic property, drawing salary of all the staff etc., and also drafting Impotent Officil communications. It is very essential that grade pay of LDC should be increased to Rs.2400.00 and Grade pay of UDC should be Rs.2800.00. The grade pay of LDC & UDC should be should be upgraded from 1900 & 2400 to 2400 & 2800 respectively by the Government w.e.f. 01.01.2006 in view of nature and responsibility of their work including qualification with high skill & mental ability. Hence, the government should take necessary action at the earliest. kindly put up the case in front of Anomonly Committee meeting which will be held on 15.2.11 strongly for welfare of LDC/UDC. Yes, I too agree that there is no difference between an LDC(who has been recruited through competative exam) and a peon or messenger working along with u, drawing the same GP. I also recommend for the increase in Grade Pay of LDC to Rs.4200/- to boost up their working spirit. The Lower Division Clerk and Upper Division Clerk are taking more responsibility to do office work and assisting their superiors in importent Official works. they are maintaining Service Records of all the staff and officers,DEALING WITH COURT CASES,FINANIAL MATTER LIKE PAY & ALLOWANCES,PENSION, MAINTENANCE OF GPF,ETC drawing and also drafting Important Official letters. It is very essential that grade pay of LDC should be increased to Rs.4200.Please do the needful. Required educational qualification of LDC has been upgraded to 12th Std, Typewriting 30Words per minute. But the grade pay of the LDC and UDC remains at par with a group `D' staff whose educational qualification is only 8th or 10th. It may please be noted that in the present status all the offices/ deptts are not having the authorised strength of clericl staff and hence with this deficiency also, we are running an organisation with deficient staff. All the works pertaining to implementation of 6th CPC has been completed in the time. You can even come across an establishments where only two or three LDC/UDC are running the show. Now what more is expected from us ? Why such step mother treatment for only our category ? I beg the authorities to please open your eye once in a life time or atleast for one pay commission since last five pay commission had done hardly anything for the clerical cadre. If this does'nt happen then in long run you can see that we are drawing the lowest pay and allowances in Central Govt. department. 3050 – 4590 4000 -6000 5000 - 7000 Grade pay corresponding to pay scale 5000 – 7000 in 6 th CPC is 4200. As per 5th CPC LDC in getting pay scale 5000 – 7000 (Grade pay as per 6th CPC 4200, See Table B) after 24 years service, now as per 6th CPC LDC is getting Grade pay 2800 (Corresponding pay scale in 5th CPC 4500 -6500, See Table A )after 30 years service. This means the financial upgradation LDC was getting in 5th CPC after 24 years service, now in 6th CPC LDC is not getting that benefit even after 30 years service. I therefore strongly recommend 2400 Grade pay for LDC and 2800 Grade pay for UDC. Educational qualification increased to 10+2, now grade pay must be revised for keep the moral high of clerical staffs. I request all the clerical staff to express their view/comment on this. Qualifiction for entry levelfor LDC's should be 12th pass with typwriwint and computer knowldege: Grade pay should be Rs.2800.00. Those who has completed 10 years of service in 2800 grade pay should be Upgraded to the grady pay of Rs.4200.00 irrespectctive of whethere post is avilabe or not. Those who have qualification of any Graduated digree should be upgraded to the grade pay of Rs.4200.00 after completion of 5 years of Service irrespectctive of whethere post is avilabe or not. Entry level for assistant post is any digree and grade pay should be Rs.4200.00 after completion of five years service the post should be upgraded to the grade pay of Rs.4800.00 irrespectctive of whethere post is avilabe or not. If post is avialable according to the seniority promosition should be given. this is becasue majority of the staff is possesing graudate digree and post graduates if financial benifits is available to the gradudate and post graduate candidated after 5 years of service thir performence in the office work will be improved and also all the employees feel proud to work hard and honestly if their financial position is good. Youth will struggle hard for the progress of the nation and wanted to bring India as super power in the world. Government should implement the and give importance to the graduates and post graduated because of lack of opportunity mejority of the graduates are facing discrimination in the orgainisation. along with this government should also bring rules to give multiple responsibilie on the graduate who can alse take as chalinge and dischrge all the multiple works. Yes LDC & UDC are dealing with responsible work and the GP of LDCs should be increased upto Rs - 2400 and of UDCs should be increased to Rs-2800. When one LDC is selecting for the post ofter two tier examination & skill test he is drawing less GP then constable (GP-2000)of Police & Paramilitary. It is a shamful for us when the constable is drawing GP-2000 and how it is justified the GP of LDCs is only 1900. Hence I hembly requesting the Govt. to upgrade the GP of LDC & UDC as early as posible. Everyone knows where the output comes from. The rank/designation of an official should be kept aside. Their responsibilites are always the first to give the basic requirements in pen & paper. Still the wages are ignored. 1900 GP is in no-way enough to lead a tension free life. These are also not to get a high dignity even in the 60's. The thing that is required to be done is GPs of 4200,6600 and 8000 should be considered for Ministrial posts with the 3 ACPs by abolishing 19-24-28 00s,& should be termed Ministrial-A-B & C respectively which will be self-explanatory. i do agree with the above mentioned comments. I am also a LDC and working with a top class department of Central government. But the grade pay 1800 is very very low as per my job profile. I am handling a matters of establishment, store, maintenance etc. So, in view to above mentioned details Our grade pay should increased to at least 2400. Is any higher authorities are bothers of this issue ? If yes when the these LDC's will get the benefit is it at the end of their retirement? LDC's serving the respective Dept. as Officer's not on paper. Perfact example of exploitation labour and right to equal work and equal pay for the matter? I Nitesh Kr. LDC working in Health Deptt.MCD, CHEST CLINIC GULABI BAGH W.E.F. 09.09.2003. My work is very responsable as like Billing , Retirement Case, RTI & other some important work, but my salary is very lowest in is office. Other health staff not work properly and responsable but he take many type allowance and highly slary. As the best of my knowledge some staff are not able to write a correct application. How the justified the govt. to LDC to give the GP-1900. yes i also agree with others. The grade pay of Clerks especially of LDC & UDC should be raised to 2400 & 2800 respectively. Hello every body, May I request Govt to allot one computer to all Tech(JTO)/ lab category(JTOs).Becos in my office all have become jto and jtos except 1 or 2 even they are also likely to become officers in near future. so that they can sit at home and work without coming to office at all,& most of the insepction & lab work can be done by computer.so that Govt can let some office buildings for rent and can earn some good amount every month towards rent and it need not pay any electricity charges also. I beg pardon if i have said something wrong & I assure that this will not occur again . It is not understood the reasons why Govt has raised the educational and other qualiications etc for LDC as the subject category is diminishing category. My superior Officer was saying that hereafter service of the clerical category is not required because of computer and the work pertaining to them will be done by tech(jto)/scientic (jtos) by giving one computer each and engaging some helper on casual basis. Pl clarify if somebody knows about the subject matter. 2400 GP FOR LDC is very much justified. Pl consider my experience along with other thousands LDCs SILENTLY SUFFERING. I was an LDC in a Central Office in Manipur.The C.A.4200 GP died while in service. Again, the Steno. 4200 GP retired. The requisition was made to the SSC, but no one filled the posts. I perform the duties of these posts in addition to my normal duty as a bill clerk. To fulfill this, I operated in three rooms.I later joined a Pay & Acct Office, Delhi as Accountant, 2800 GP on deputation. Though the workload is heavy,in the absence of Sr. Accountants 4200GP, I clear all their files/bills and sometimes managed a section alone for weeks. I was given "OUTSTANDING" grade in the ACR.Work exigencies of my parent dept.bandh deputation for a time being reverted me to LDC. Now,I attend office only in name, my mind is not in office.I'm only waiting how to get out of this office.This is not a positive trend.I'm an example of thousands of LDCs who can easily handle all the duties of 4200 GP, but have to wait 30 yrs. to get 2800 GP no matter how qualified you are. I am pursuing MBA through Distance Edu. MY computer knowledge of DDP, hardware & maintenance + free training by NIC is more than sufficient for an LDC.We"re are not asking no less or no more than 2400 GP only. Pl help, we're desperate. There is no work left for LDC/UDC due to Computers. They just sit idle many times. Class IV who really do hard labour do deserve Grade Pay equal to LDC/UDC. Therefore Grade Pay of LDC/UDC should never be increased and Grade pay of erstwhile Group D employees should definitely be increased by the Government from minimum Rs. 1800/- to Rs. 2400/-. I am a IIT worker. One of my Superior told me that 6th Pay Commission is a Officer Oriented Commission and no LDC/UDC or any office staff other than A-grade Officer can avail the service of an attendant. All B-C grade worker have to carry the papers themselves. Is there any such rules mentioned in 6th Pay Commission? Is there any mandatory rules or Supreme Court's Order to all the Govt. Offices to maintain WORKING MANUAL?? If yes, Please give the reference. I strongly agree with the other brothers and sisters of clerical cadre who were badly suffering. There is only a meagre difference of Rs 100/- between a Group'D' staff and an LDC. In the Andaman and Nicobar Administration the LDCs are looking after the duties of more than UDC and upto some extent to the level of AICs. LDCs at A&N Administration is performing the duties of bill clerk, budget, Store, Accountant, Counter Clerk in Railway counter, Shipping. Doing the works of Data entry operator etc. In other words it is better to say that without the services of the LDCs Administration will be become paralyzed.So considering the heavy work load of the LDCs the concerned ministry/ department should take it seriously to enhance the grade pay from 1900 to 2400. It is also to say that now a days while awarding ACP to LDC they are getting the marginal hike of Rs.100/- instead of Rs.2400/- their too LDCs are sustatining loss. In all the ways the LDCs are only sustaining loss. This should considered seriously heavily in interest to increase working interest of the LDCs. I am agreed with the decision that LDCs Grade pay should be increased. I really wonder why the Government is so insensitive toward LDC How can an unskilled staff be given higher benefits than the skilled staff? The monetary difference between MTS and LDC is 100GP only. The MTS are getting extra benefits of liveries in the form of winter/ summer uniforms - shoes pant, shirt, coat, sarees etc. plus washing allowance.Those MTS drawing TPT Rs. 600-/ had a lump sum jump to 1600 TPT basic when they cross a certain pay. 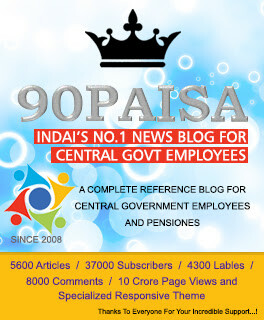 It means more than Rs.2000 jump even in normal increment. whereas LDC have to wait 10 yrs to get 100/- more GP.Pl be logical in reason, otherwise other neighboring nations will mock as irrational Indian. woh! woh! Mubarakko!To keepers of law of the World NO.1 Democratic Country!! !Where is the law for LDC? Where is the Constitution of equality? Devashish You are absolutely right.Your comment worth considering. Pl understand me. Whereas, the LDCs were the biggest losers during the 5th PC. Again, the 6th PC has added salt to their wound. Further, Min. Edu.Qua.has increased from Cl. X to 12 and typing speed from 30 wpm to 35 wpm whereas no GP increased. Where are we heading? Now, in order to qualify SSC Clerk Grade exam. we need 2 yrs extra + 2 yrs from applying to written,typing test and receiving offer of appointment. In between, one need min. 6 months rigorous regular typing training to get to 35 wpm. By this time, the person would have been graduated.All these time,efforts,money,etc. yield only 100 GP(the mount which cannot buy even a cheapest sandal for children) more than the unskilled employees who're already there with Cl.VIII certificate, many of them hardly able to write or read even their own name. Why such a burden to LDC only. If LDC is an unwanted post better abolish it. I can't understand the wisdom of of the competent authority. How can our children who"ve been spending thousands of rupees in their schooling be given such a low salary with bleak prospect? Reply from concerned authority to email will be highly appreciated. I Sincerely support your comments, it is really very very pathetic condition. Competent Authority is discriminating the his own employees like LDC and UDC. Our painful cry is not yet reached the Competent Authorities. Some one is to start hunger strike with the inspiration of Honorable Anna Hazare and All staff LDC and UDC should support in the issue. Pl compare some of the past questions of Clerk Grade Exam with Assistant Gr, Inspetor Grade, SAS,Combine Graduate, etc. and prove me if Clerk Grade Exam is easier,rather this has more obstacle of qualifying typing test. Such a qualified person is given only Rs.100/- Grade Pay more than the almost illirate Peon, Chawkidar,etc.Hon'ble Minister, repected Secretary, DOPT, Dept of Fin & Exp, I hope you too have sons and daughters, grand children, one day they may be a victim of your own heartlessness for the LDC. Pl wake up before it too late and at least give LDC 2400 GP which is quite rational. I to have the same experience like Khamrang. Though I am simply an LDC, I can handle any kind of work in the office.As Most of the drafts of my seniors and Gazetted officers were being corrected by me or even they seek my advise how to prepare their official documents. They draw 10,000/- 20,000/-,30,000/- more salary than me. Most of my seniors avoid me because they can neither speak English when we I speak English nor read or write English properly, but they are being given 4200/-, GP 5400/-, 6600/- GP Ha! Ha! Ha! Mubarako! How come? Got mad! God must be crazy or Government must be crazy! So what? The pig did the work, but the dog got the credit.So go on, harden your heart, those on the high position, since it never pinch you even though 1000s or 100000s of LDC suffer, never upgrade the GP pay of LDC. When I read LDC,UDC I feel it is like LKG and UKG. It is better to merge the two posts and redesignate as office assistant and grand a grade pay of 4200/- Otherwise this issue will not solved and Group D staff get more benefit than us. It is not relevant with welfare state, it appear as an oppressive instrument to the LDC across the country. Pl Upgrade the GP of LDC to 2400 GP so that after getting 3 ACP/MACP an lDC can exit from the Government service with honor and sense of satisfaction. When the requisite qualification stipulated for a Lower Division Clerk is 10+2 pass with proficiency in typing / handling PCs, why is the graduates, post graduates, PhDs are getting into this position. Is it because they are unemployable in the jobs corresponds to their qualifications? If so, they are clearly misfit as LDC no matter what the perks are. Why not they seeking HAG as those at HAG also have only these qualifications. MOST OF LDC ARE HIGHLY QUALIFIED AND ENTERED IN SERVICE AFTER VERY TOUGH COMPETITION & WHEN HE GET PAY IN THE PAY SCALE 5200-20200 WITH GP 1900, WHICH IS JUST NEAR TO GROUP D POST I.E PAY SCALE 5200-20200 WITH GP 1800, AND WASHING ALLOWANCE 75/- PLUS UNIFORM WHICH GO HIGHER THAN LDC'S PAY IN TOTAL. AFTER COMPLETING 10 YEARS SERVICE HE GOT RS.100/- AS MACP THAT IS WHAT ? IT IS NOT INJUSTICE? I AM WORKING IN SALT COMMISSIONER'S OFFICE AND THERE IS NO PROMOTION AFTER 20 YEARS SERVICE, I AM NOT ALONE THERE ARE MANY EMPLOYEES IN MY DEPARTMENT AND AS WELL AS IN OTHER. SO I DEMAND GP OF RS 2400/- FOR LDC & RS. 2800/- FOR UDC.